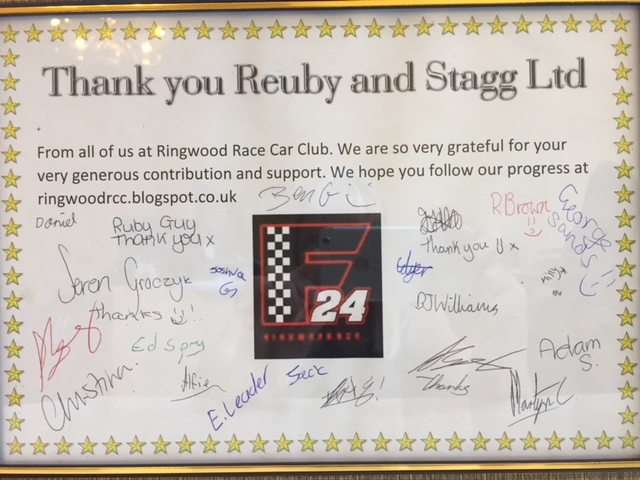 Reuby & Stagg have sponsored Ringwood F24 Race Car Club | Reuby & Stagg Ltd.
A group of nineteen ambitious students from Ringwood School, led by Subject Leader for Technology Mr Storey, have set up the school’s first F24 Race Car Club. Their mission is to design, build and race an electric car at regional and national events in 2018. The students have been inspired by the Greenpower Education Trust who have set up this unique challenge, sparking enthusiasm for Science, Technology, Engineering and Maths (STEM) through the excitement of motorsport. The club meet every Wednesday after school and work in various teams, such as the steering team, the chassis team and the marketing team to bring the various elements of the project together. To design, build and race an electric car is a huge challenge and the school would like to thank Reuby and Stagg Ltd for helping to get the project off the ground with their generous sponsorship investment.